What’s the best thing about coming back to the States from West Africa? Vegetable variety. Yes, access to asparagus and swiss chard and fresh broccoli narrowly beats out living close to friends and family. The quality of fruits and vegetables throughout West Africa is incredible. Everything bursts with flavor—after all, West African varieties haven’t been bred over the course of a century for appearance and sturdiness. Fruits come straight to the market from their trees. But it’s nice to have access to a diverse selection of fresh fruits and veggies. The great thing about spring in DC is that many of the fruits and vegetables I buy are grown locally (for varying degrees of “local,” of course). Crystal City has a lovely farmer’s market, and I’ve been taking advantage of it to buy fruits and vegetables to compliment my GMO bred-for-longevity but OH SO AFFORDABLE Costco veggies. Even at the farmer’s market, sugar-free nitrate-free (that is, Whole30 compliant) bacon is prohibitively expensive. I’ve been looking for paleo-friendly way to stretch my bacon dollar, as well as incorporate vegetables (which is, after all, why I’m so happy to be back in DC). Bacon Wrapped Asparagus does both. 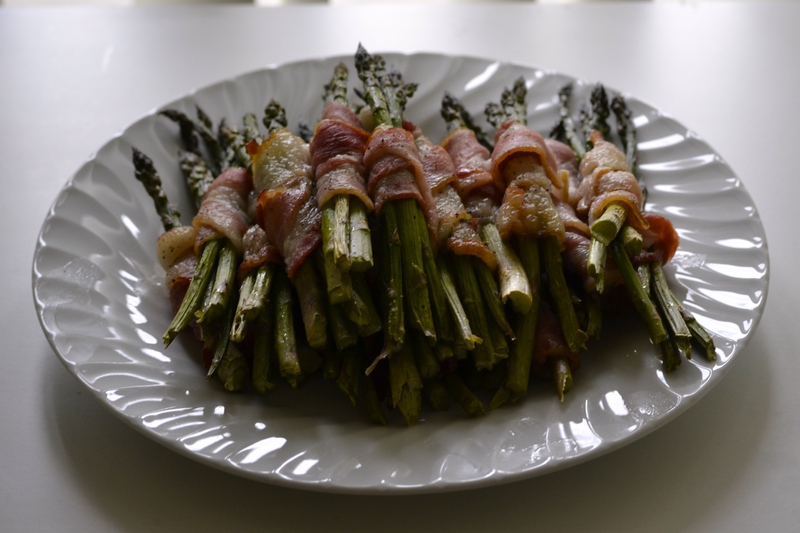 The plate pictured is one rasher of bacon, and a double bunch of asparagus. Rinse and pat dry asparagus. Snap off any tough ends. Wrap bunches of 3-4 spears in half a slice of bacon (cut the short way, not the long way). Place bunches on a grill on a cookie sheet (or, if you’re living out of an air freight shipment like me, use aluminum foil to create a fake grill) so that the bacon grease has somewhere to drip. Drizzle exposed asparagus with olive oil, lightly salt and pepper. This looks/sounds amazing! Asparagus here is super expensive and not very good when it’s even available, and I’ve been craving it lately. Yummy! I agree with you – quality of fruits/veggies in many places in Africa is superb, but the diversity can be hit or miss. We’re pretty lucky here in Uganda, but I do miss asparagus and artichokes. And berries. Oh, berries.